The Richmond Oktoberfest is the most authentic German folk fest in Virginia. Since the Richmond Oktoberfest began in 1969, many civic groups, bars and even churches have more recently discovered Oktoberfest and have started sponsoring Oktoberfest themed events as fund raisers. The original Richmond Oktoberfest was and remains “the real deal”. While it doesn’t have the size of the original Oktoberfest in Munich, it is very much like a real local or regional Folkfest in Germany. The Richmond Oktoberfest was started in 1969 by two ethnic German clubs, the “Gesangverein Virginia” and the “Deutscher Sportclub”. 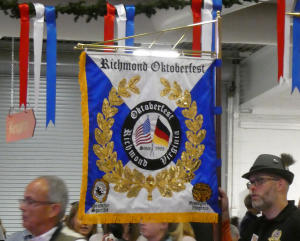 After some years, the two clubs incorporated the Richmond Oktoberfest as a non-profit corporation under the laws of the Commonwealth of Virginia. The Presidents of the two clubs appoint the members of the Oktoberfest’s Board of Directors and the Oktoberfest continues to be actively supported by both German clubs and their members. “Gesangverein Virginia” means “Singing Association of Virginia”. The Gesangverein began in 1852 when German immigrant men living in Richmond decided to get together to sing the songs of their homeland. Today, it is a German social club dedicated to the preservation of German traditions and language in the Richmond metro area. Not only does it help put on the Richmond Oktoberfest, but it also uses proceeds from the Oktoberfest to give scholarships to college students in the Richmond area studying German language and literature. The “Deutscher Sportclub” started in 1960 as a soccer team with members who had come from Germany to work in Richmond for German companies such as Hauni and Inta Roda. Over the years, it has transitioned from a men’s soccer team to a social club for both men and women, who gather to celebrate a variety of German festivals such as two Karneval parties. Karneval (also called “Fasching” in some parts of Germany, “Carneval” in Rio and in Florence, or “Mardi Gras” in New Orleans) has a long tradition. The first of these Karneval events is the Kappenfest, which we celebrate after the 11th day of the eleventh month, when the Karneval season starts and the Karneval Ball, which is celebrated prior to Ash Wednesday. Other events are the Sommernachtsfest (Mid Summer Night Festival), the annual German Style Christmas Party, and other parties and picnics. Like the Gesangverein, the Deutscher Sportclub also uses Oktoberfest proceeds to give scholarships to college student doing German studies. The idea for the Richmond Oktoberfest first occurred to Mr. Edwin Lohmann after he attended the Munich Oktoberfest in Germany in 1965. Ed had already become aware of the popularity of this festival among American GI’s when he was stationed in Bavaria (8 years prior to 1965), but the Army would not grant him leave to attend during those years of military service. Around 1967, a new Safeway Store was opened in Richmond, and since they planned to have a large selection of goods from around the world, this store became known as the International Safeway. For the Grand Opening they planned a big event emphasizing different ethnic groups. One of the groups that performed at that occasion was the Washingtonia Bavarian Dance Group from Washington D. C. Ed Lohmann, Erich Albus and his wife Christel, as well as others of the Richmond German Community attended the celebration. Watching the dancers reminded Ed of his years in Germany and the Oktoberfest he had attended in Munich. The result was that he spontaneously invited the entire bus load of dancers to his house. Needless to say, it turned into a great party. The dance group must have enjoyed this party, because they promised to perform free of charge, if Richmond would ever start its own Oktoberfest. In 1968, a planning meeting was held with GV President Ed Lohmann, GV Vice-President Frederic (Fritz) Schwenk, DSC President Adolph Naujokat, and past DSC President Erich Albus in attendance. These gentlemen and some cohorts from the two clubs met at the Gesangverein meeting place, the old Virginia Inn on North Chamberlayne Avenue, where they formed a committee that worked out the details for the first Richmond Oktoberfest. From the beginning the committee decided that the Fest should be an authentic German style festival filled with good German entertainment, that would result in what the Germans call “Gemütlichkeit” (cozy, homelike, informal, good natured) fun. The First Oktoberfest Committee consisted of: Ed Lohmann, Adolph Naujokat, Fritz Schwenk, Herbert van der Rydt, Joe Illig, Frank Berling, Erich Albus, and the first secretary, Ursula Sorensen. Ed Lohmann, Adolph Naujokat, Erich Albus, Frank Berling and Fritz Schwenk, were members of both the Virginia Gesangverein, and the Deutscher Sport Club. Adolph was then the President and Fritz and Erich were past Presidents of the Deutscher Sport Club. So, in 1969, the first Oktoberfest of Richmond was held at the old Holiday Inn (The Abbey) on Robin Hood Road. Ed, Fritz, Adolph, and Erich secured the financing for this event from the two German Clubs. Fritz Schwenk had an Oktoberfest banner made for use at the 1969 Oktoberfest, which was designed by Adolf Naujokat. The beer served was Richbrau, which was then brewed in Richmond. The 1969 Fest exceeded all expectations with almost 500 people in attendance. A Richmond Oktoberfest beer stein was designed and beer steins were given to all paying attendees, a tradition which continued for many years. There was no date on the first stein nor did it say “1st Richmond Oktoberfest”, because no one knew at that time that the event would continue in future years. In 1970 the Oktoberfest moved to “The Arena”, which was located on Hermitage Road where the Diamond Complex and the Arthur Ashe Center are now located. In his later years, Ed Lohmann recalled that the tradition of holding the Oktoberfest on the third weekend in October arose because it was so hot inside the Arena, that it was necessary to hold it in cooler weather and to throw open all the doors for ventilation. The Oktoberfest was held at the Arena for 10 years and became a two-night event (Friday and Saturday) in 1975. Because of increasing popularity and larger attendance, the Oktoberfest was moved to the Exhibition Hall at the Virginia State Fairgrounds at Strawberry Hill in 1980. In 1999 the Oktoberfest was moved to the Showplace on Mechanicsville Turnpike, because the Fairgrounds were in the process of being bought by the NASCAR organization and turned into the Richmond Raceway Complex and rental agreements could not be firmed up. In 2013 the Show Place property was converted into a Roses store and the Oktoberfest was once again forced to look for a new home. The Oktoberfest Board of Directors thought of moving back to the “Exhibition Hall” at what was now the Richmond Raceway Complex and went to look at that building. As they were leaving, one of the Board members, Russ Boraas, convinced them to also look at the Old Dominion Building, which had been the State Fair’s cattle barn. It had been built in 1943 and was designed by William Lawrence Bottomley, the well-known architect who designed many of the most impressive Colonial Revival homes on Richmond’s Monument Avenue. A large brick structure on the Register of Historic Landmarks, it had sloping ceilings on four sides, surrounding an elevated roof in the center, which was over a 63 by 100 foot cattle judging area. Upon entering the building, the Board of Directors was immediately struck by similarity to the interior of a beer tent at the Munich Oktoberfest and the suitability of the building for the Richmond Oktoberfest. As a result, the Old Dominion Building became the new home of the Richmond Oktoberfest and what had been the cattle judging area became the Oktoberfest’s dance floor. Now after 50 years, the Oktoberfest of Richmond has grown from the 500 people in 1969 to about 4500 people over two nights. Some things are different, but many things remain the same. For example, a Richmond Oktoberfest beer stein has been designed and produced each year since the beginning, but in about 2010, the rising cost of the steins made it necessary to sell the steins, instead of giving them to each paying guest. These beer steins, designed in Richmond, but made in Germany, have become collector’s items in many homes. The Oktoberfest banner designed by Adolf Naujokat, which Fritz Schwenk had made for the first Oktoberfest, is still used today as part of the elaborate decorations which adorn the hall. Additional banners were made for the 25th and 35th Anniversaries of the Oktoberfest. In 2018, for the 50th Anniversary, a traditional German style banner, known as a “Standarte” was made to be carried in processions, both at the Oktoberfest and elsewhere, to represent the Richmond Oktoberfest. It is of a traditional type carried in parades by many clubs and civic organizations throughout Germany as their official emblem. Another element of the Richmond Oktoberfest that has carried on since the beginning is the emphasis on German style entertainment. The primary emphasis is on high quality bands, which not only can play traditional German Oktoberfest music and sing in German, but which can also play a variety of music and create great crowd participation. The Richmond Oktoberfest actually helped foster another group of great entertainers. In 1972 Frau Sandra Hurdelbrink’s German class at J. R. Tucker High School started dancing traditional Bavarian folk dances. Under Frau Hurdelbrink’s tutelage and with some early help and instruction from the Washingtonians, who had performed at our first Oktoberfest, they became S.G.T.E.V. Hirschjäger Bavarian Dancers. The Hirschjägers have performed at each and every Richmond Oktoberfest since their inception. Unfortunately, all members of the original Oktoberfest Committee, except Erich Albus and Ursula Sorensen, have passed away. While Erich and Ursula have long since retired from organizing the Oktoberfest, both still are volunteer workers who help put on the Oktoberfest. The Richmond Oktoberfest has not gone unnoticed in Germany. Each year, the German Ambassador, working through the Cultural Affairs Section of the German Embassy in Washington, D. C., sends one or more official representatives of the Ambassador to the Richmond Oktoberfest. They take part in the opening ceremonies of the Oktoberfest and typically an Ambassador’s representative crowns the Richmond Oktoberfest Queen. An even greater honor was bestowed on three of the founders of the Richmond Oktoberfest. In recognition of their work to promote German culture and foster good relations between the United States and Germany through their work with the Oktoberfest, the Federal Republic of Germany awarded Ed Lohmann, Fritz Schwenk, and Erich Albus the “Bundes Verdienst Kreuz” (“Federal Cross of Merit”), a high civilian honor. Now after fifty years, the Board of Directors of the Richmond Oktoberfest promises to continue to provide the citizens of the greater Richmond area with an “authentic” annual German Oktoberfest. May it endure for another fifty years. Hans Stienen, Brad Ewald, Chris Reitmeier, Gary Miller, Gary Ilch, Alexander Raring, Russ Boraas, Sonny Cecil, Tim Graf, Carmen Hoge, Armin Grashoff, Graham Sherrod, Rosie Ellett, Doug Kountz.